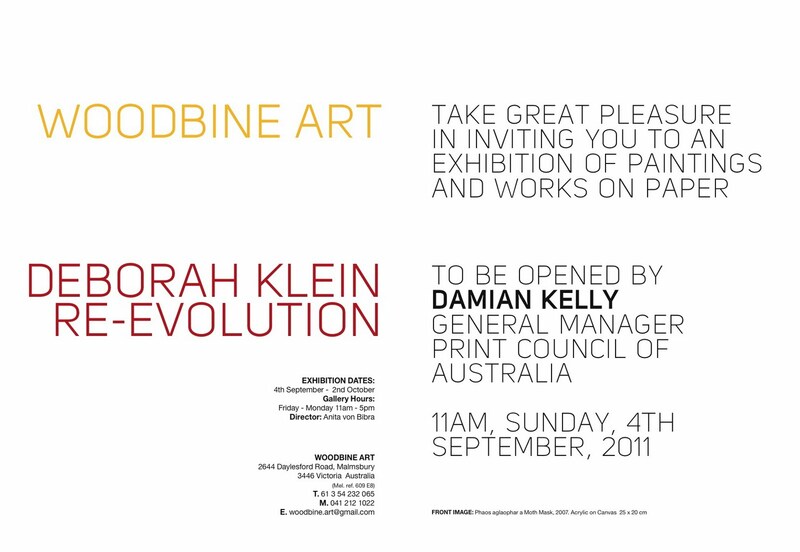 Click on the invitation above for full details of the exhibition. Do call in if you are in the area at the time of the launch on Sunday 4 September, or during the show's run. Dr. Penny Peckham's accompanying essay is reproduced below, with her kind permission. 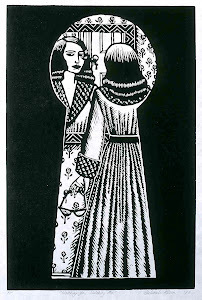 Deborah Klein’s art has long reflected an interest in narrative, in storytelling, particularly stories in which female characters are central. Early prints relate to stories of female saints; others portray scenes relating to film noir. From childhood she has been fascinated with fairy tales, folk tales and fables, particularly those dark and rich in symbolic motifs - the traditional and those given a contemporary twist by writers such as Angela Carter. 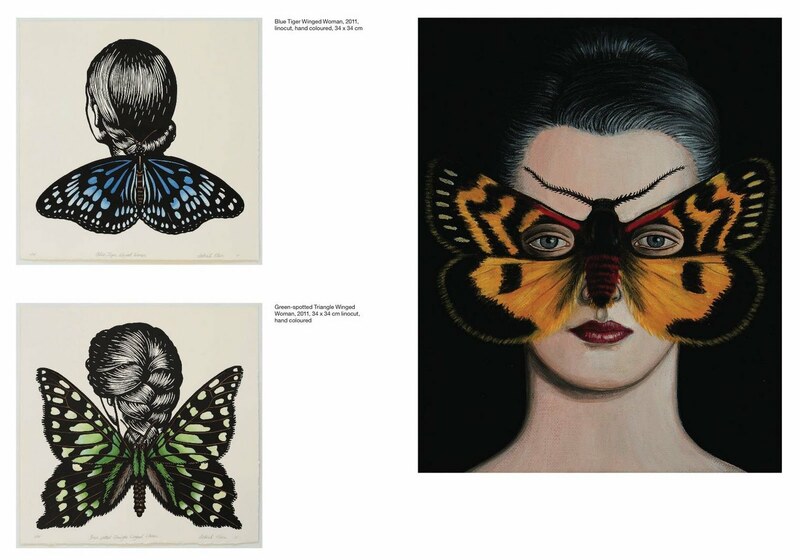 As early as 2000 Katherine McDonald drew a parallel between Klein’s female subjects and butterflies, observing that in ‘depicting women as anonymous specimen like creatures, Klein seems to be inviting us to view the decorated heads as a connoisseur/collector might study the outer wings of a pinned butterfly, with little regard for the inner being’. To extend the metaphor, moths and butterflies are often seen as symbolic of the ephemeral nature of life – beautiful and fragile, fleeting – and so too female youth and beauty. The general title of this recent body of work, Myth-Entomology, refers to Klein’s dual interests in story-telling and insects. Metamorphosis (from pupa to moth or butterfly, human to insect) and hybrid creatures often feature in the kind of tales that are of particular interest to Klein. The earliest of the works were created for the 2008-9 exhibition, The enchanted forest- new gothic story tellers. 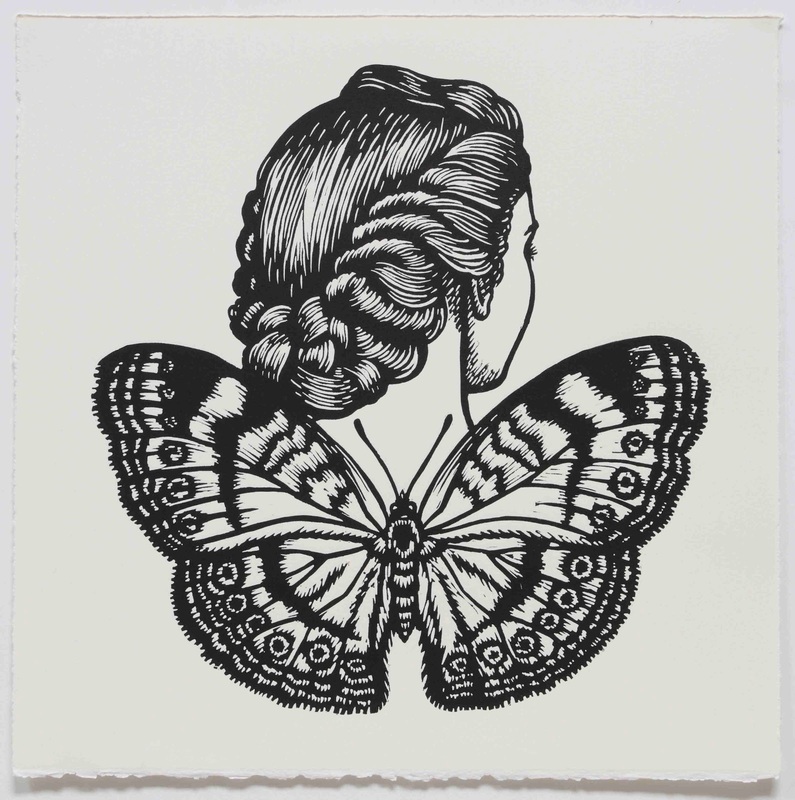 Curator Jazmina Cininas selected the earlier multi-panel painting, Swarm (from 2000), in which sixteen species of butterfly are paired with rear view ‘portraits’ of sixteen elegantly coiffured women. Participating artists were invited to also make new work and, partially inspired by her reading of A.S. Byatt’s Angels and Insects, Klein painted the first of the Moth Mask series. But are her Moth Masks and Winged Women hybrid creatures – part human, part insect – or do the women wear the insects as adornment or disguise? Like many of Klein’s previous female subjects whose faces have been veiled by lace or tattooing, turned away or cropped from the picture frame, so the faces of the Moth Mask women are largely hidden by exquisitely-rendered moth species, mostly from the Indo-Australasian region. As the moths vary in size, shape, colour and patterning, so now each of the women are portrayed as distinct individuals. Klein has said that each moth was chosen to match each subject, not as fashion accessories, but as extensions of themselves. She sees the moth masks as ‘magical’. They are ‘real’ moths that in part perform the function of masks, as well as being something like the daemons in Philip Pullman’s His Dark Materials trilogy. 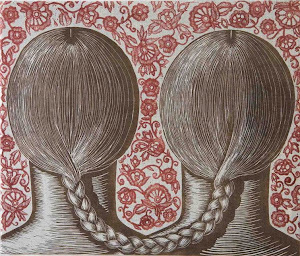 There is also something magical about the eight Enchanted Hair Ornaments prints, which link back to earlier works in that the women wear elaborate hair combs - in the form of various insects and one spider - in their intricately knotted hair. 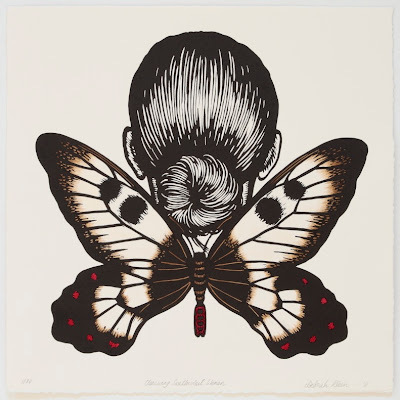 In the Winged Women linocut prints the protagonists also face away from the viewer and the focus is again upon their hairstyles – braids, rolls and chignons – and the delicately hand-coloured butterfly set high on the back of each. This observation may well have been inspired by the painting Lace Butterfly 2000, in which the rear view of a woman’s elaborated coiffed head is teamed with a butterfly-shaped piece of lace. Katherine McDonald, ‘Woman’s Other Visage’, Private Collection, Australian Galleries exhibition catalogue, Melbourne, 2000.
 email to the author 27 July 2011. In Pullman’s series of books, a daemon is a manifestation of a person’s soul. 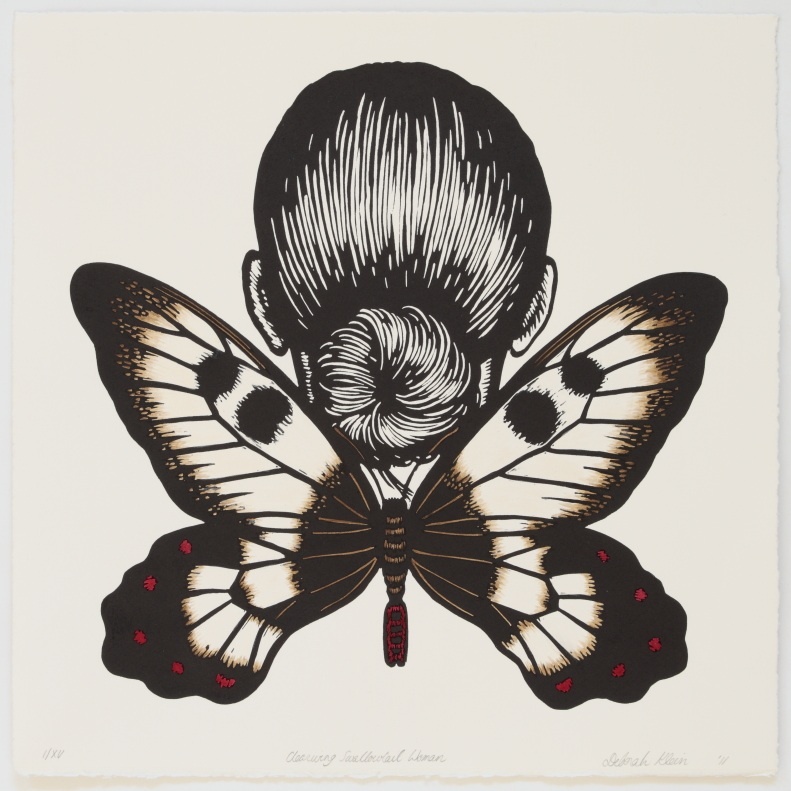 Chocolate Argus Winged Woman is a finalist in the 2011 Silk Cut Award for Linocut Prints. The exhibition will be launched at the Glen Eira City Council Gallery on Friday 2 September and runs from 3-18 September. For full details, click on the invitation below. 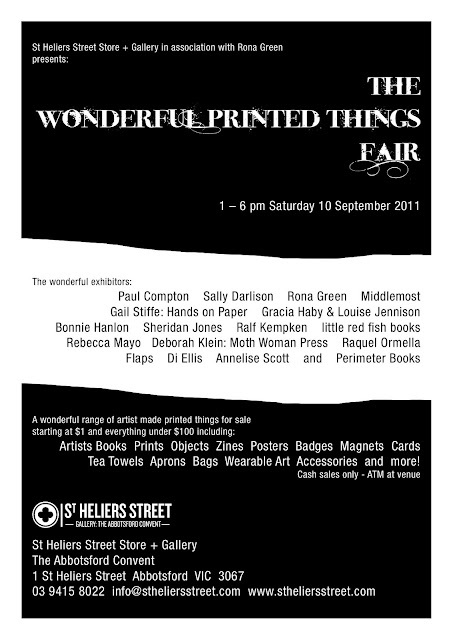 Below (top) is the flyer for the inaugural WONDERFUL PRINTED THINGS FAIR on Saturday, September 10 from 1 – 6 pm. The fair is on for ONE DAY ONLY and entry is free. I’m very much looking forward to being a part of it and rubbing shoulders with so many artists whose work I admire. If you are not familiar with the venue and its surrounds, the Abbotsford Convent Arts Precinct, its cafes and grounds and the adjacent Collingwood Children’s Farm are additional treats in store. I will be previewing two new zines at this event. Further details can be found on my artist’s books and zines blog Moth Woman Press HERE. Presenting for the first time more hybrid creatures in living colour. Like Swarm*, the fairy tale that spawned them, the Winged Women are in part a fanciful reflection on insect taxonomy and the skilled, but largely overlooked work of Australian female colonial naturalists and artists, including Mary Morton Allport, Annabella Boswell, Georgiana McCrae and two of my favourites, South Australian sisters Martha Berkeley and Theresa Walker. It was my original intention to hand colour the series in the manner of natural history illustrations. But at the time of proofing I felt the images worked equally well in their virginal state; I wondered if the addition of colour might appear superfluous. 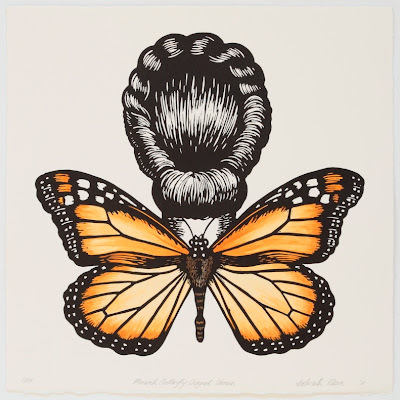 At their debut in the exhibition Natural Histories at Chrysalis Gallery last October, the black and white Winged Women provided a necessary counterbalance to the numerous coloured pastel drawings and paintings that made up the rest of the show. Within the entirely different context of Re-evolution, it’s time for them to show their true colours. *From There was once…The collected fairy tales (2009). 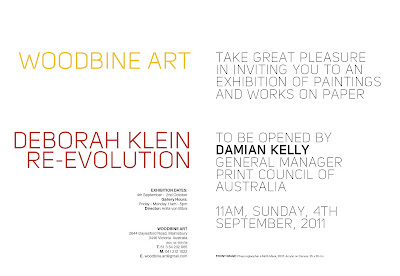 On 4 September my solo exhibition Re-evolution opens at Woodbine Art Gallery in Malmsbury. It has given me the opportunity to gather together a selection of work from the past couple of years, including The Moth Masks, The Enchanted Hair Ornaments and the Winged Women series. This will be the first time it has been shown collectively, albeit in an edited form. Recently I began preparing special hand coloured editions of eight of the Winged Women prints especially for Re-evolution. During the process I became more than ever drawn to watercolour, and given the direction in which the work is currently heading, anticipate using it as a medium in its own right in the future.